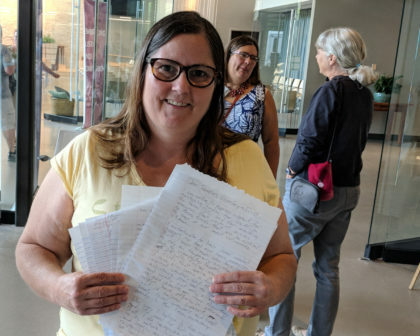 This summer the congregation began a monthly practice of writing letters to Iowa’s Congressional delegation as part of the “Write Here! Write Now!” campaign.” About 20 letters were sent to Capitol Hill in July to address concerns about the treatment of immigrant families at the U.S./Mexico border, and more than 40 letters were sent in August in support of the Supplemental Nutrition Assistance Program, formerly known as food stamps. The campaign is organized nationally by Unitarian Universalists for Social Justice, whose mission is “to mobilize and amplify the voice of Unitarian Universalists as we seek to change the world through acts of love and justice.” Each month UUSJ chooses an advocacy topic, and UU congregations from across the country submit copies of letters that are then reprinted and hand delivered on Capitol Hill by members of the UUSJ’s Advocacy Corps. The society’s involvement in the campaign began after this summer’s UU General Assembly. Sally Hartman, co-chair of the UUS Social Justice Coordinating Committee, connected with UUSJ member Lavona Grow at General Assembly, and then helped organize a July 14 meeting in Des Moines in which UUs from across Iowa discussed legislative strategies and reviewed electoral justice toolkits, created by UUSJ. 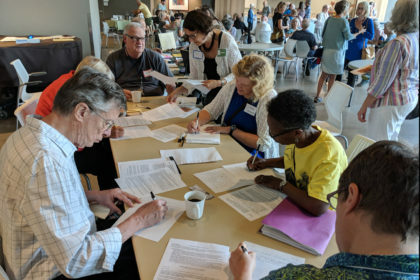 Twenty five UUs from eight congregations and fellowships attended the meeting, and the Des Moines congregation has also joined in the letter writing campaign. 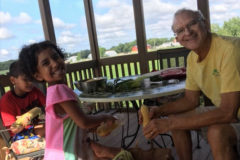 Iowa congregations face an uncommon challenge in their advocacy efforts, because Sen. Grassley will not accept mail unless it is delivered by an Iowan. Fortunately, Hartman was able to recruit Danielle Jones to fill this role. 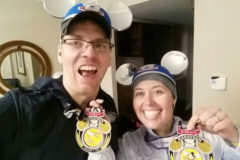 Jones is a former Iowa City resident and past UUS member who now lives in Alexandria, Virginia and attends the Unitarian Universalist Church of Arlington. Look for the letter writing table on the second Sunday of each month during coffee hour. Advocacy topics will be published in advance through the weekly email and the UUS Facebook page.